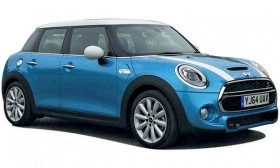 Mini's new five-door model, shown, is helping to boost the brand's volume. (Bloomberg) -- European car sales rose for a 20th consecutive month in April, bolstered by a reviving economy and new models from Renault, BMW and Fiat Chrysler Automobiles. Registrations in the EU and EFTA countries increased 6.9 percent from a year earlier to 1.21 million vehicles, the Brussels-based industry association ACEA, said in a statement today. Four-month sales jumped 8.1 percent to 4.85 million cars. The gains extend the auto market's longest growth streak since the ACEA began compiling figures in 1990 and maintain a recovery from a two-decade low reached in 2013. Business confidence in Germany, Europe's biggest economy and largest car market, was at a 10-month high in April after first-quarter economic growth quickened in countries using the euro. Sales increases were propelled by deliveries of SUVs including the Renault Captur, Jeep Renegade and BMW X5. "The European car market has been performing above expectations, and the month of April is confirming the trend," said Juergen Pieper, an analyst with Bankhaus Metzler. "The European economies are doing well, which is helping to boost car sales," he said. All major European automakers posted April growth. Volkswagen Group registrations were up 5.4 percent with gains of 5.6 percent at the core VW brand, 18 percent at Porsche, 9.5 percent at Skoda and 3.7 percent at Audi. Seat sales fell by 1.1 percent. PSA/Peugeot-Citroen's sales rose by 2.5 percent with the Peugeot brand's 5.8 percent increase outpacing 1.1 percent growth at Citroen. Volume at the new DS brand dropped by 17 percent on an aging lineup. Renault's registrations jumped 15.3 percent with volume at the core Renault brand growing faster at 15.6 percent than Dacia's 14.7 percent gain. Download PDF, above right, for Europe sales by automaker and brand for April and 4 months. Ford's registrations increased by 2.3 percent while Opel/Vauxhall sales rose by 5.7 percent. Fiat Chrysler's group volume increased by 13 percent as demand almost tripled at the Jeep division and jumped 9.7 percent at the Fiat brand, helped by the new 500X SUV. Asian automakers except Toyota and Honda saw growth in April with Nissan registrations rising 9.3 percent, Hyundai 8.6 percent and Kia 6.8 percent. Toyota brand's volume fell by 2.4 percent on an aging model lineup. Honda's sales plunged 25 percent. BMW sold 12 percent more vehicles, thanks largely to a 34 percent surge at the Mini division, which has brought out a five-door version of its basic hatchback. BMW's namesake brand posted a 7.8 percent increase. Daimler's European sales jumped 7.8 percent as a revamped two-seat city car and new four-seat variant won 56 percent more buyers at the Smart brand. The Mercedes-Benz nameplate sold 3 percent more vehicles. Volvo's volume increased by 11 percent while Jaguar Land Rover saw 17 percent growth. All five of Europe's biggest car markets expanded last month, with Italy's gain the largest at 24 percent. Demand rose 6.3 percent in Germany, 5.1 percent in the UK, 3.2 percent in Spain and 2.3 percent in France. Sales are being encouraged by rebates as "pricing remains tough," Max Warburton, an analyst at Sanford C. Bernstein, said in a May 13 report. "Italy's gains are partly founded on rental cars, and France's retail demand is still tepid." Dealer discounts in Germany averaged 12 percent off the sticker price in April, compared with 11.7 percent a year ago, according to trade publication Autohaus Pulsschlag. Renault and Fiat were among the carmakers offering the biggest incentives.